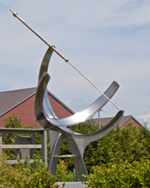 This 9-foot stainless steel equatorial is the centerpiece of "Galileo's Garden". The sundial was built and dedicated in memory of Kathleen Fischer, a sixth-grade science teacher who inspired many students to pursue science. The sundial is an open armillary, with an adjustable hour band so that both local solar time and civil time can be read. At the tip of the gnomon is a bronze and brass true-size rendering of Galileo’s first telescope, honoring the 400 years since Galileo explored the heavens. The North American Sundial Society was privileged to donate to this effort. The instrument rests on a one-ton granite disk donated by Goodrich of Danbury, CT; the disk was used in the tooling process for making telescope mirrors and now forms the center for an outdoor classroom. All of the graceful curves in the structure are geometric – including catenary curves, parabolas, and circle arcs. The dial is situated in a flower garden with 60 varieties of sunflowers. Seen with the sundial is a 6-foot model of the sun, center of a six-mile scale solar system that traverses the town of New Milford.